Olimp Vita-Min Plus is a dietary supplement that contains an advanced complex of 12 vitamins and 10 minerals in highly absorbable forms and concentrations providing up to 100% of daily requirement. This supplement is special because the mineral components are in form of Albion® amino acid chelates, what guarantees their high bioavailability and assimilability. In addition, the formula is enriched with a standardized green tea extract which is a rich source of antioxidants, and supporting eyesight lutein. Vitamin A plays an important role in maintaining skin health and the proper functioning of the immune system. It also controls the course of gene transcription processes. Together with lutein, they keep eyesight in good condition. The effect of vitamin A on the skin involves mainly keeping its correct level of hydration and firmness. The studies also demonstrated that daily vitamin A supplementation clearly limits the number and depth of small wrinkles. Vitamin D is essential for maintaining healthy bones and joints. Research shows that vitamin D supports osteoporosis treatment and reduces the risk of fractures. It also prevents the development of rickets in young children. Additionally it supports the cognitive functions of brain, modulates the immune system and improves mood. Daily supplementation with vitamin D positively influences hormonal balance of both men and women. Vitamin E and vitamin C are natural antioxidants. It means that they remove free radicals - potentially harmful, very reactive molecules from the system inhibiting the development of signs of aging. They also reduce the risk of cancers, rheumatoid arthritis, atherosclerosis or skin diseases. In addition, vitamin C increases immunity what is especially important in winter and early spring. Vitamin K takes part in blood coagulation processes. Its appropriate level reduces the risk of cardiovascular disease. In addition, vitamin K acting together with vitamin D plays a significant role in maintaining healthy bones. It has been proved that daily supplementation with vitamin K improves their structure and volume. B vitamins are mainly responsible for proper functioning of the nervous system. They participate in converting carbohydrates to glucose - fuel for neurons, and are crucial in neurotransmitters synthesis. What's more, vitamins B6 and B12 contribute to formation of myelin sheath around the axons of nerve cells, what significantly speeds up the transmission of information in the central nervous system. Additionally, B vitamins support the cardiovascular system (thiamine), support the immune system (riboflavin) and participate in hormone biosynthesis (niacin). Their action is visible in lowered blood cholesterol levels and improved skin appearance. Pyridoxine reduces the occurrence of painful muscle contractions, and biotin prevents grey hair and hair loss. Folic acid, is an essential dietary supplement for pregnant women, as it supports proper development of neural tube in the foetus, and prevents anaemia. Green tea extract contained in the supplement is a source of intense antioxidants. It contains as much as 55% epigallocatechin gallate (EGCG). It is a compound with strong antioxidant properties - 100 times stronger than vitamin C. In addition, 98% of the extract consists of polyphenols, - organic chemical compounds. Apart from their antioxidant properties they have the ability to reduce the risk of cardiovascular disease or cancer. In addition, this supplement contains numerous minerals (such as iodine, selenium, magnesium, zinc, iron or chromium), that support functions or prolong the duration of vitamins in the plasma. They are also responsible for strengthening bones, joints and skin, as well as respiratory, blood, immune and nervous systems. All mineral components come in form of amino acid chelates. It means that in the production process the elements have been coupled with weak acids or amino acids. Then, the process of hydrolyses takes place in the he body, and the elemental ions are released. It makes them better absorbed and distributed throughout the body. Additionally, thanks to the fact that the elements are released in the intestine, they do not irritate the stomach or previous sections of the digestive system. Lutein is a pigment of carotenoid structure, similar to pre-vitamin A, and it contributes to improvement of eyesight. It is present in yellow vegetables and fruits, for example in peppers, but it also occurs in egg yolk. This compound accumulates in the eyes, and through its antioxidant properties it reduces stress caused by free radicals. Its use is recommended especially to people who strain their eyes, for example during long computer work, watching TV or using a smartphone. 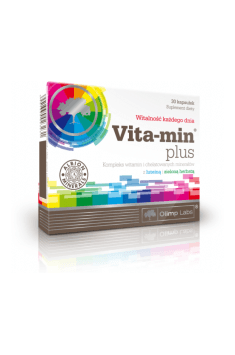 Summing up, Olimp Vita-Min Plus is a dietary supplement recommended for adults who want to provide themselves with up to 100% of the daily requirement for essential minerals and vitamins. It should also be considered by people whose demands increase, for example, those who intensively practice sport pregnant women, mentally active people or the elderly. Take 1 capsule daily after a main meal with plenty of water. This supplement contains vitamins and minerals soluble in both water and fats, so it is recommended to take the capsule during a meal. It should be remembered that the meal should not be rich in fat, because it may limit the absorption of some ingredients (e.g. magnesium). We recommend to take the capsule with a glass of water to provide an environment for the hydrolysis of mineral chelates.